While on a group hike in the mountains near Asheville, Tracy met Mountain Xpress staff writer, Virginia Daffron. Virginia covers City Council meetings as part of her work as a local journalist in Asheville. She talked about the difficult job City Council members have on certain complex issues, trying to integrate so many different points of view into their policy decisions. Tracy observed that the Council could be using much better community engagement and collaborative decision-making processes than they do, to better handle these complex issues. 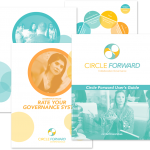 Besides Circle Forward, Tracy told Virginia about a number of other collaborative methods and skillful facilitators who make their home in or around Asheville. 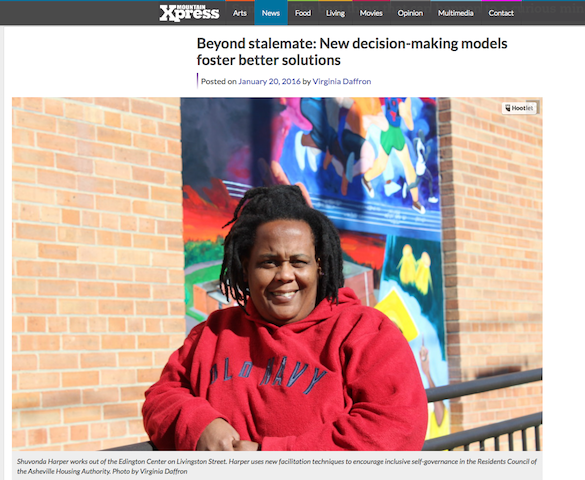 Virginia was intrigued and decided to write an article about these new decision-making models and systems for the “Best Ideas” edition of the Mountain Xpress. Thanks for a great article, Virginia!